Just before the First World War, a royal decree imposed prohibition in Russia. The ban on alcohol lasted 11 years. 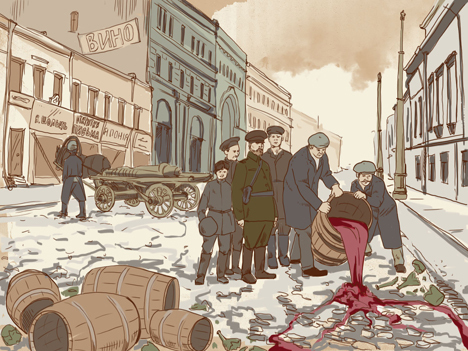 On July 31, 1914, a tsar's decree banned the manufacture and sale of alcohol in Russia. Originally, the ban was due to hold during mobilization, as Russia was entering the First World War. However, almost immediately it was extended for the duration of hostilities. After that, the right to ban alcohol was handed over from central government to local authorities: city dumas, rural communities and district councils. Then some cities and districts allowed the sale of wine and beer, but vodka remained banned everywhere. State Duma members from among the peasantry proposed a bill removing alcohol "from free circulation for eternity". Wisely, the bill was not passed, but the ban on alcohol remained in force for a long time: The Bolsheviks chose to maintain it after the 1917 revolution, meaning that prohibition in Russia lasted 11 years in total. Statistically, Russians were not particularly heavy drinkers: For instance, France consumed five times as much alcohol as Russia; Italy, three times as much. However, Russians drank mostly vodka and did it with a vengeance: not that often but in shocking quantities. During the Russo-Japanese war of 1904-1905, widespread drinking among conscripts created problems during mobilization, and the number of soldiers with alcohol-induced mental disorders was considerable. Ahead of the new war, the tsar traveled across several Russian provinces. "With great grief, he witnessed sad pictures of infirmity, family poverty and neglected businesses, the inevitable consequences of life that is other than sober," wrote historian Sergei Oldenburg at the time. In early 1914, the tsar sent a rescript to the Ministry of Finance with an instruction to "improve the economic wellbeing of the people, notwithstanding financial losses,” since budget revenues should be coming not from the sale of something that destroys "the spiritual and economic powers" of the people but from other, healthier sources. That was a truly radical step, as revenues from vodka sales made up no less than one third of the state budget. Yet, when putting together the budget for 1915 and in spite of the fact that Russia was at war, the State Duma totally excluded vodka revenues. British politician David Lloyd George described it as "the single greatest act of national heroism.” The very possibility of such a move testifies to the enormous economic potential that Russia had at the time. Right after prohibition came into effect, statistical research was conducted to study its effects. The fascinating findings were published in works by psychiatrist Ivan Vvedensky, prominent physician Alexander Mendelson and others. According to them, there was a dramatic drop in crime, mental hospitals had hardly any patients left, and village life was miraculously transformed. Peasants were not only upgrading their farms, buying samovars and sewing machines but were also depositing spare money with saving banks. Many of those polled said they were ready to pay additional taxes for as long as the sale of alcohol remained banned. "Even domestic animals have become more cheerful," one of the respondents said. Some unexpected problems arose: Medical schools complained of lack of corpses for anatomy lessons. There used to be many suicides, the bodies of which ended up at medical schools, however, the number of suicides dropped once there was no more drinking. The authors of those studies acknowledged that prohibition had some negative effects too. Chief among them was a rise in the making of home-distilled vodka in villages and in the consumption of surrogates (denatured alcohol, polish, varnish) in towns - though it was believed that it was only hopeless drunks who could drink hooch and polish as substitutes for vodka. Lack of alcohol created certain problems in everyday life too. Alcohol-free weddings did manage to gain some popularity, as people liked the fact that they cost less. However, a Russian funeral without vodka is inconceivable. There were also fears that boredom and lack of vodka might push some people toward gambling and depravity. However, against the backdrop of a rising wellbeing and prosperity, those minor negative effects were of no consequence, the authors of the brochures concluded. Yet, not everything was quite so rosy. In August 1914 alone, some 230 former drinking saloons across Russia were smashed as people demanded vodka. In some of those incidents, police had to open fire on the rioters. The governor of Perm appealed to the tsar to allow sale of alcohol for at least two hours a day "in order to avoid bloody clashes.” Mobilization did not go quite as smoothly as expected: Conscripts stormed closed wine warehouses in towns, troops were sent in to disperse them, and there were hundreds of casualties. During the revolution, wine riots became a regular occurrence. Bolsheviks had to pour the whole of the Winter Palace’s wine cellar (with bottles worth thousands of gold rubles) and other precious wine collections down the drains to prevent them from being seized by soldiers, who would have drunk themselves senseless. Since vodka distilleries had to be shut down, nearly 300,000 people ended up out of work and the state had to pay them compensation from the budget. In reality, consumption of vodka surrogates in towns skyrocketed, with production of polish and varnish increasing tenfold. Private memoirs dating from the years before the revolution paint a picture not of happy sobriety but of mass drinking in villages. Hooch was made from almost everything: sawdust, shavings, mangel beets and other fodder crops. Strong alcohol was sold only at expensive restaurants, further breeding discontent among those who could not afford it. In addition, the war and prohibition caused a massive rise in drug addiction, especially in St. Petersburg. Earlier, cocaine and heroin had been sold in drugstores, however, at about the same time many substances were classed as dangerous narcotics and were banned. However, as early as 1915, traffickers managed to establish opium supplies from Greece and Persia, while cocaine was brought over from Europe. It was cocaine that became inseparable from the image not only of the decadent St. Petersburg youth but also of the Bolshevik commissar in his leather jacket. The Soviet authorities abolished prohibition in 1925, as they needed money to modernize the country's economy. According to contemporary accounts of the day, when distilleries were put back in operation, people in the streets wept with joy, hugging and kissing each other. According to other accounts however, there were also those who were crying not from joy but from fear and desperation. Many of the characteristic features and rhetoric of that time bear a striking similarity to the features and rhetoric of the anti-alcohol campaign launched by Mikhail Gorbachev in the 1980s. Reports of alcohol-free weddings with whole passages devoted to how great they are could be lifted, practically unchanged, from the pages of accounts from 1914 and put into 1986 newspapers. The main similarity, however, is that in both cases the launch of anti-alcohol campaigns ended up with a regime change in the country. The author is a writer and winner of the Russian Booker prize.